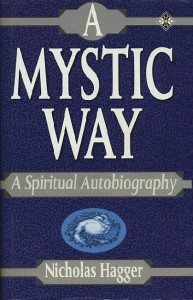 A Mystic Way is a spiritual autobiography in which the author shows how his life gave rise to his writings up to 1993. He concentrates on his growth as an artist and the business of creation rather than the social fabric of everyday life or the complexities of character. In this “Portrait of the Artist” Nicholas Hagger presents the development of his Universalist vision as a metaphysical process, rooted in a profound experience in September 1971 which has inspired his subsequent work. Events are not presented in the ordinary narrative manner, but rather as incidental to the flux of thought and feeling which shapes the destiny of an individual. Hagger’s aim is to evoke his spiritual evolution or journey of the soul. A Mystic Way tells the story of how Nicholas Hagger’s literary works up to 1993 came to be written and of his growth through the traditional stages of the Mystic Way: purgation, illumination, a Dark Night and enhanced perception to a unitive vision. There are detailed accounts of Nicholas Hagger’s experiences of the Light (e.g. pp.195-99) and of the way the Light has shaped his life. His poems and philosophy can be seen growing out of his life. The book details his meetings with literary figures, including Edmund Blunden, Ezra Pound, John Heath-Stubbs, David Gascoyne and Colin Wilson, and also his role in founding the Heroes of the West (to reverse the work of the Cambridge Apostles) and the Universalist Philosophy Group (to reverse the work of the Vienna Circle). It also describes how he came to own one Essex school, which he attended as a child, and to found a second one. The Metaphysical Revolution itself can be seen as emerging in the late 1970s, and Universalism towards the end of the 1980s. By quoting from 30 years of Diaries, Nicholas Hagger is able to show his thinking and perceptions as one flow, as a process which is perpetually growing and developing. A Mystic Way is the story of a quest for truth set against the background of our Age and a finding of the Reality behind the Universe. It traces the author’s mystic journey from his awakening in 1950s Oxford, through a period of purgation in 1960s Iraq and Japan, where he began to discover himself as a poet, to a Dark Night in Libya and then a month of profound mystic illumination in London in 1971, and eventually to a metaphysical outlook and the unitive vision that shines through his poetry, his unified view of history and his philosophy of Universalism. In the course of his journey, which recalls St. Augustine’s Confessions, Nicholas Hagger reconciles the active life of his teaching and (later) ownership of two schools to the contemplative life of a philosopher, historian and poet. He finds a pattern in his life which may be attributed to the workings of Providence. This work shows how his poems and stories grew out of his life and reflect his search for truth and his attempt to understand the Age in which we live. The book has many perceptions and observations. This is the story of a unique quest (or truth in the maelstrom of modern existence, and the finding of the Light, the reality behind the universe, by a philosopher, cultural historian and poet. It traces Nicholas Hagger’s mystic journey from his awakening in Oxford in the 1950s to his eventual metaphysical and unified view of history and philosophy – Universalism. We are led through a sequence of life-changing experiences and revelations, including a period of purgation in Iraq and Japan, where he began to discover himself as a poet, a Dark Night in Libya, and then a month of profound mystic illumination by the Light in London in 1971. The unitive vision he achieved shines through his poetry and thinking. In the course of his journey Nicholas Hagger reconciles the active life of teaching and ownership of two schools with the contemplative life of a philosopher and poet. A Mystic Way is a highly rewarding and inspiring book, offering profound perceptions and observations.